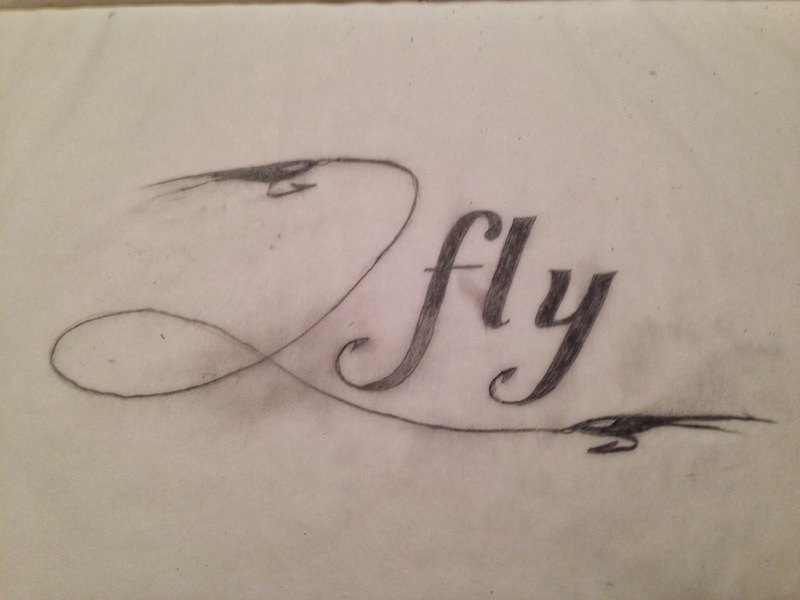 A possible rendering of the boat name, courtesy of my talented wife. Not bad, eh? Winter is typically a quiet time for saltwater fishermen in this part of the world. Sure, there are holdover stripers in the coastal rivers, trout to be had in tailwaters like the Farmington, and ice fishing for the truly hardy. My mind turns to other pursuits during the cold months. Winter provides its own joys that need to be enjoyed because the good days of skiing, sledding, or ice skating never stick around for long. This year is different, and my fishing is taking a significant change. In 2014, we will be exploring the Mudhole by boat. I look forward to sharing some of that adventure and the learning curve that goes with fishing central Long Island Sound and beyond. A deposit for our slip just went out in the mail. Calls with the builder are increasing in frequency as we get closer to the date our boat goes into the mold. The number of decisions to be made between now and then is a bit daunting, but the most difficult part is waiting. One other thing they did wonderfully was make it easy to install fishfinders. Poking around online provided some good information on how to install a Humminbird. Both brands are owned by the same parent, Johnson Outdoors, so naturally they would like to support each other. 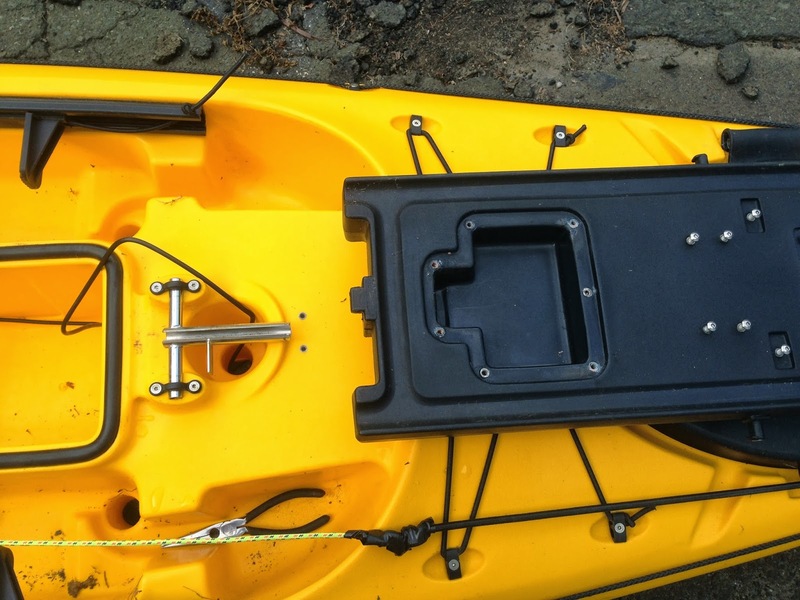 Ocean Kayak made it easy to install virtually any fishfinder on this boat. After digging around for a tutorial, I drew a blank. 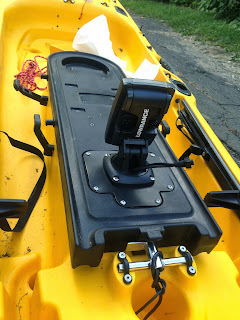 In the hope of contributing something back to the online community of kayakers who helped me, I've tried to document some of the steps that are required to make a nice, clean installation. It's not hard! I chose a Lowrance Elite-4 as a reasonable balance of cost, size, and features. It's a combo unit that has both sonar and GPS capabilities. The color screen is nice particularly for navigation. The fishfinder is really best for identifying structure in the water that I've used it. The one feature it lacks that I would have enjoyed is some kind of trip counter so you could see not just the 'breadcrumb' trail of where you paddled, but also get stats like time, speed and distance. Ok, you could argue it's time to put the technology aside and just go fishing, but I do kind of enjoy it. Here's where we're trying to end up. What's nice about the OK Ultra 4.3 is how clean you can make the installation. No cables are exposed to snag. 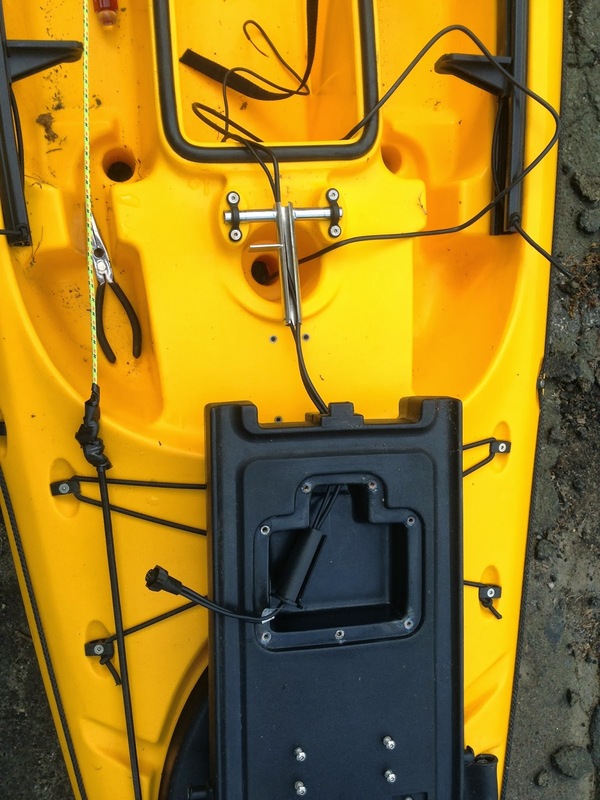 The transducer is tucked away, protected from damage if you bump across rocks while launching. Pretty cool! The installation itself is pretty straightforward. There is one tricky part, however-- threading the large plug through a small hole. I had trouble finding any information on this. How do you fit this thing through that tiny hole? In the end it wasn't that tricky. The photos and descriptions below focus on this. The remainder of the installation process is pretty straight forward. Here we go! Turn the boat onto its side so you can work on the bottom. 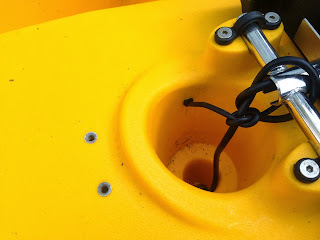 Ocean Kayak gave us a nice recessed pocket to install the transducers into. Notice the two threaded sockets in the pocket. They're sized perfectly for the bracket included with the Lowrance transducer. 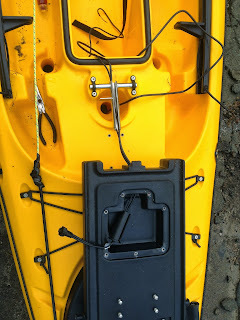 From the bottom, thread the cables through the scupper hole above the recessed transducer pocket. Next, we want to remove the cover for the hatch. Flip the boat right side up. In the photo below the hatch has been removed. You can see our transducer cable coming out of the scupper hole and out of the left side of the photo. Notice the stainless steel "T" piece that hinges the hatch cover. This unconnected piece slides into the hatch. This is the hole that's too small to get your big transducer plug, through. Here's where the Ocean Kayak designers did a nice trick. The "T" is a full tube for the hinge portion (running top to bottom in the photo). However it's an open 'C' channel piece running left to right. This is where our cable is going to go. The trickiest part of the whole job is getting the cover off the hinge. Flip the hatch open as in the photo above. First, you need to remove the plastic cover for the recessed cable storage area in the hatch cover. It's held in place by seven screws. This is where you'll eventually hide all that transducer cable. The photo above shows the hatch cover with the cable storage cover removed. The photo below shows the cover itself. Your cover won't have holes in it yet. Those come later when we install the combo unit mount. Once you remove the cover, you'll see where the "T" hinge enters the hatch cover. 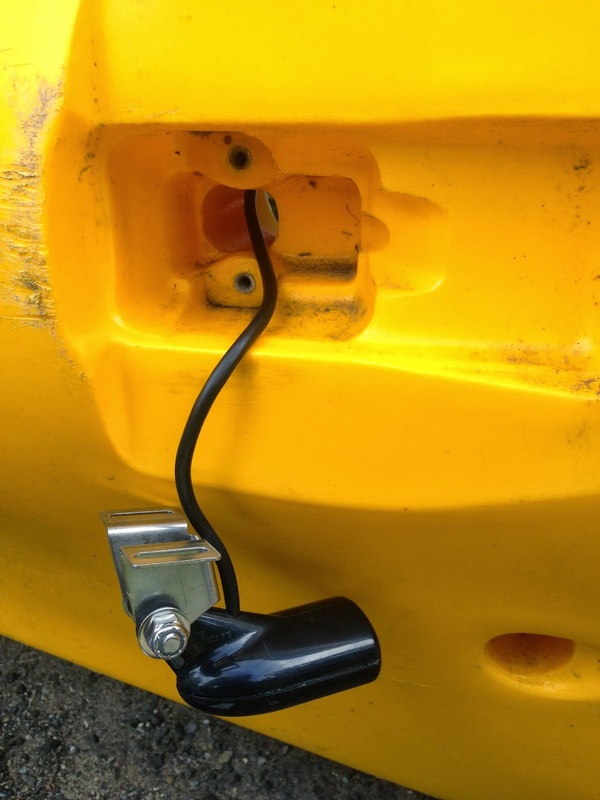 It's held in place by a plastic bushing and a metal lock ring. This takes a pair of needlenose pliers or similar. It's a pain, and I'm not ashamed to say I bloodied my nuckles trying to remove it with a screwdriver before realizing they were the wrong tool for the job. This is the worst part of the entire process, and other than that locking ring it's really not bad. 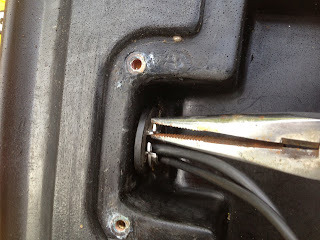 Remove the lock ring, remove the bushing, and slide the hatch cover off the "T" hinge. Now you install the transducer to the bottom of the boat. This fixes the length of your cable so you can tidy things up above the waterline. Using two M5 bolts, install the transcuer into the recessed pocket on the bottom of the boat. In order to prevent the cable from moving around, I tied it around the "T" hinge. Highly recommended. Give it just a little slack so the hatch cover can move free without putting pressure on the cable. 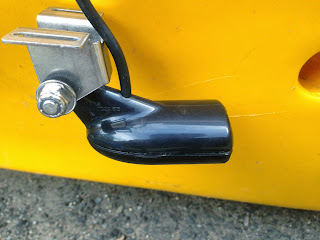 The transducer cable runs down into the scupper hole. 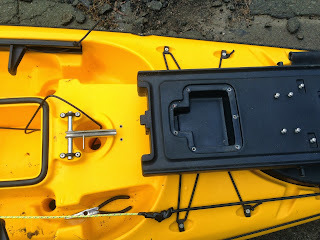 You'll notice the smaller cable going into a hole in the plastic on the side of the scupper. This is the power cable. 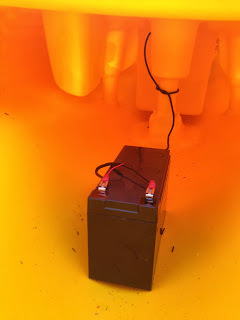 I "installed" the battery in the boat (by which I mean I duct taped it in place to see if I liked that location, but then rejected it), but I think it would be better to move it to the stern. The cable's not long enough, so that's another project for another day. Unsatisfactory battery install in the bow compartment. 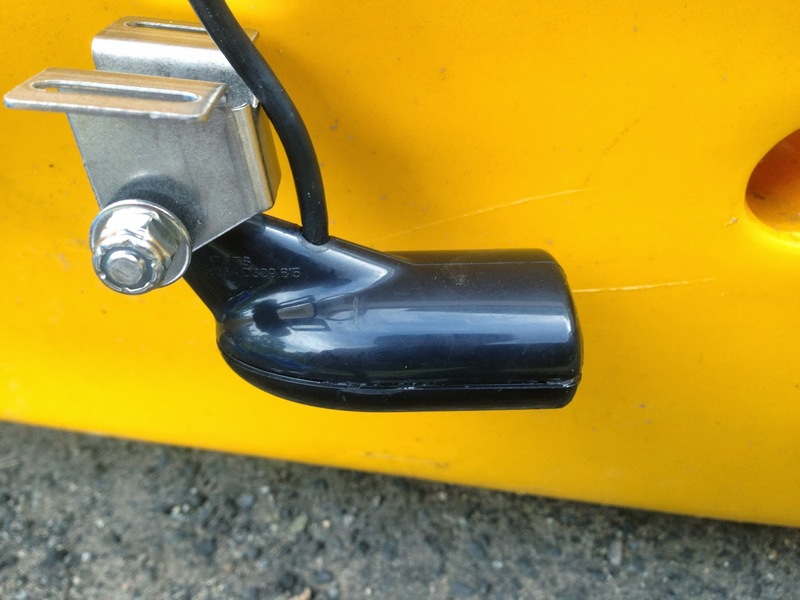 Now you need to thread the transducer cable through "T" hinge and the opening in the hatch cover, as shown below. First, lay the cable into the "C" channel of the hinge. Then push the cable's terminal end through the hole in the hatch. Finally, lay it into the plastic bushing that holds the cover in place. Push the cover back onto the "T" hinge. Push the bushing back into the hatch cover. Then re-install the lock ring. 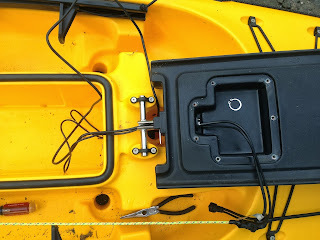 In this photo the bushing has been pushed in, and the lock ring is resting in the cable storage area. Next you are going to modify the cable storage area cover. (Remember those holes we pointed out before). 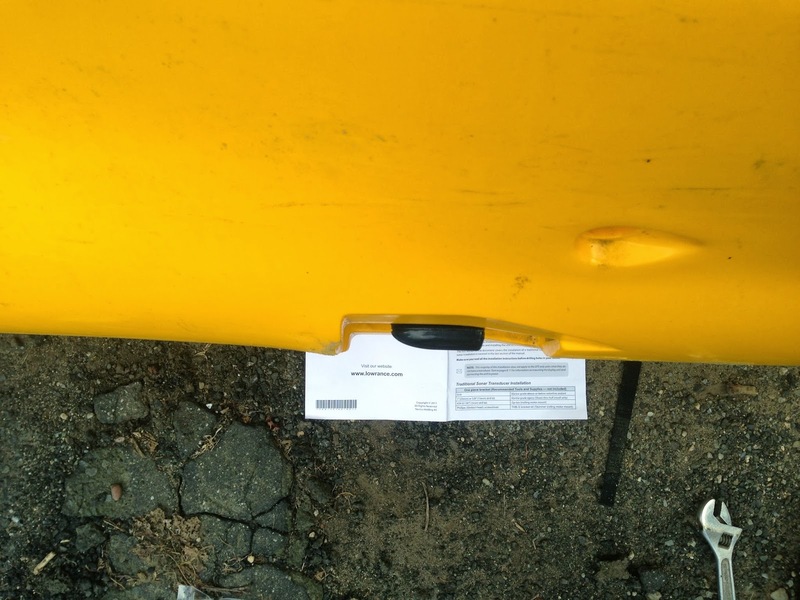 The fishfinder's base screws directly to the cover. 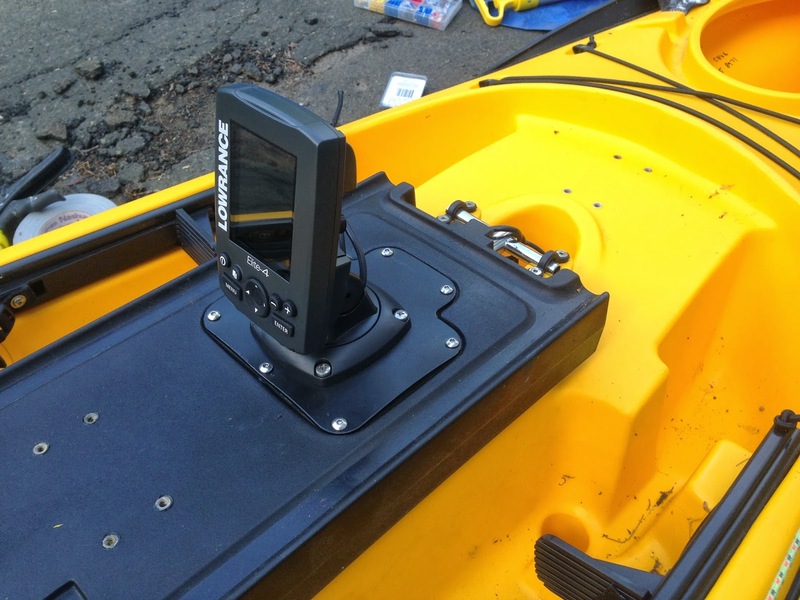 Ocean Kayak gave us a blank canvas to work with so virtually any fishfinder will work. Put the base on the cover, mark the location of the holes, a start drilling. I put the Elite-4 pretty much dead center. 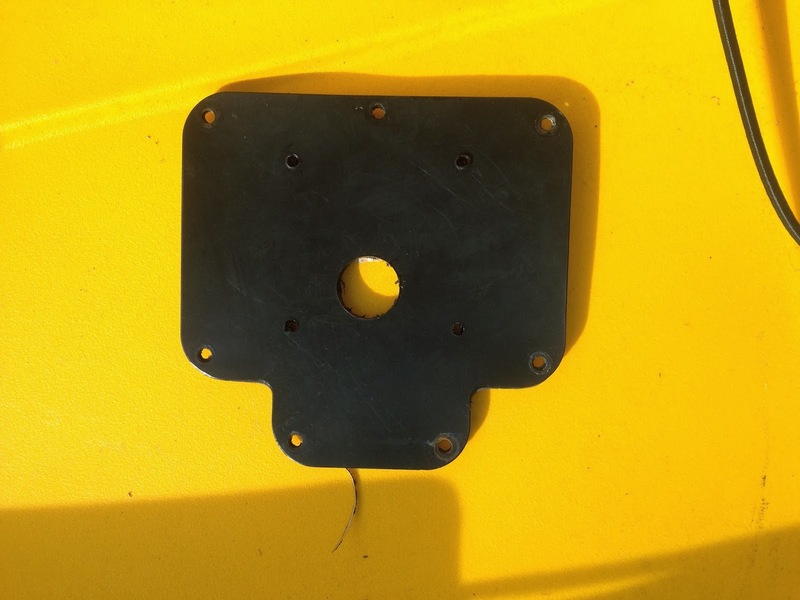 In the end we have 7 small holes around the edge to reinstall the cover to the hatch cover, four small holes to mount the Elite-4's base, and one large hole through which we run the transducer cable. If you use a different unit, make sure the location you pick will allow you to rotate and close the hatch lid with the fishfinder installed! 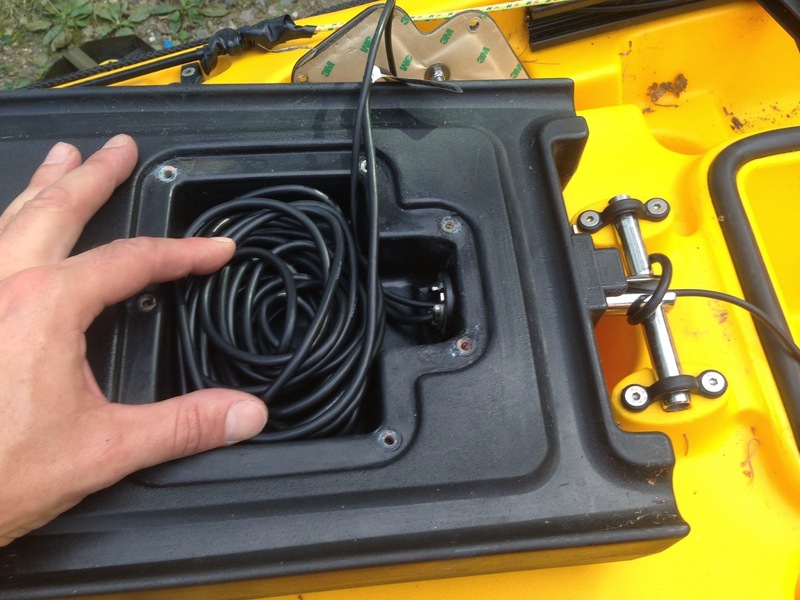 Install the fishfinder base to the cover and set it aside. Sorry, not photo. Now we finally get to do something with all that cable. Coil, cram, and wedge it down into the recessed storage area. Thread the connector out the large hole you made in the cover. You want to give yourself enough slack to connect and disconnect it to the fishfinder so you can remove it for transport or storage. Now reinstall the cover on the coiled cable using the seven screws. Click the fishfinder into it's base. This photo shows the final install. all that remains of the cable is the portion running into the scupper hole and the the slack I left on the connector end. Neat and tidy! Hopefully you find this useful. Total time, including head scratching and monkeying around, was a little under an hour. Enjoy!